When you think of traditional Chinese souvenirs, tea may spring to mind, and MingCha Tea House is the perfect place to pick it up. 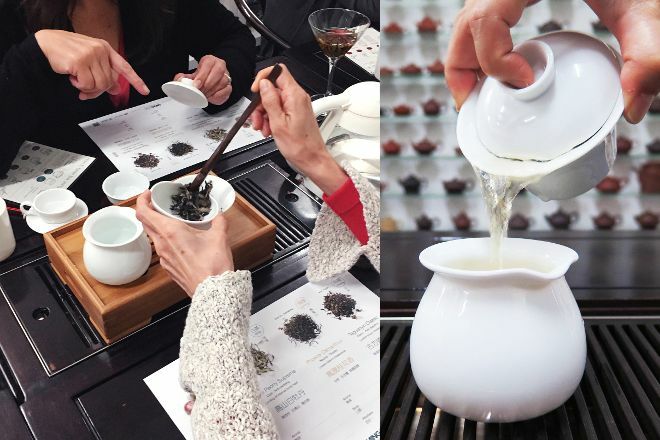 Whether you are an expert or complete beginner with tea, the attraction provides a tea master to educate you on Chinese tea before making your choice. Selections include green, jasmine, white, black, red, flower, and oolong teas. Get involved and attend a tea tasting or tea workshop, which provides a more in-depth looks at tea selections. Check the website for workshop and tea tasting schedules. A visit to MingCha Tea House represents just the start of the adventure when you use our Hong Kong holiday tool to plot your vacation. Thank you for the lovely tea tasting! We came unannounced, and were given a warm welcome. Learned a lot. A little tough to find, just ask the door person for help if you need it when you enter the building. We had an incredible class with Tomoko at MingCha! This experience is really good for anybody- whether you live in Hong Kong or are visiting. We did the Chinese Tea workshop and learned SO much! We tried 4 kinds of teas and went in depth about how they are prepared, how they are best brewed and what foods they combine well with. Tomoko was so friendly and sweet and made the class very special for us. It was a full two hour experience and WELL WORTH IT! I got the class as a gift and i recommend it to anyone! Already planning on going back for another one of their workshops :)! HIGHLY recommend!!!! I would absolutely recommend MingCha tea to anyone looking to learn about tea. I'm a little bit more knowledgeable than most when it comes to this subject, so I didn't learn a ton, but I did still learn a fair bit about jasmine and green teas. My boyfriend however (who is basically strictly a coffee person) absolutely loved the experience and learned so much. I think because of the variety of teas and subjects that are discussed in the tasting, it's a great experience for anyone. Absolutely worth the price, I would recommend it to anyone. Great experience for newbies. Great selection of teas. You can try two types of teas for free, then you have to pay about $10USD for each tea you want to try. Expensive, prices are made for tourists. You can buy the same teas online from China, for a lot cheaper. Overall, good experience while visiting Hong Kong. Every day, we help thousands of travelers plan great vacations. Here are some tips on how to use your Listing Page to attract more travelers to your business - MingCha Tea House. Promote your permanent link - https://www.inspirock.com/china/hong-kong/mingcha-tea-house-a296935455 - on your website, your blog, and social media. When a traveler builds a plan from this page, the itinerary automatically includes MingCha Tea House. This is a great way for travelers looking for a great vacation in your city or country to also experience MingCha Tea House. Promoting your link also lets your audience know that you are featured on a rapidly growing travel site. In addition, the more this page is used, the more we will promote MingCha Tea House to other Inspirock users. For best results, use the customized Trip Planning Widget for MingCha Tea House on your website. It has all the advantages mentioned above, plus users to your site can conveniently access it directly on your site. Visitors to your site will appreciate you offering them help with planning their vacation. Setting this up takes just a few minutes - Click here for instructions.